The first piece of the Badgerys Creek puzzle has been put into place with a surprise $1.2 billion dollar announcement for a new motorway running between Cecil Hills and Luddenham. 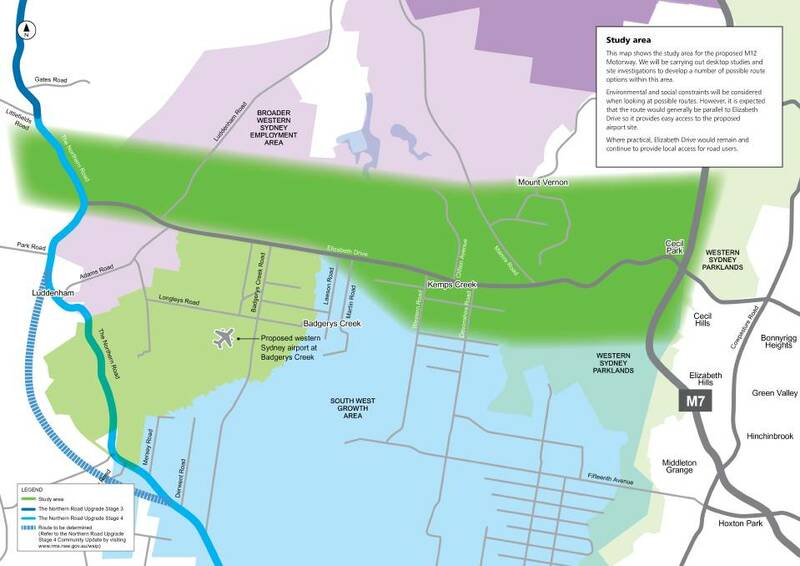 Roads and Maritime Services, on behalf of the Australian and NSW governments, is proposing to build a new motorway providing direct access to the planned western Sydney airport at Badgerys Creek and connecting to Sydney’s motorway network. Though the Bringelly Road upgrade was the first part of the Western Sydney Infrastructure Plan package to undergo construction, the M12 is one of the most significant, said the spokesperson. The M12 Motorway is one of the major projects being developed as part of the WSIP. The Australian and NSW governments are jointly funding this 10 year, $3.6 billion investment program for western Sydney. The Plan will deliver major road infrastructure upgrades to support an integrated transport solution for the region and capitalise on the economic benefits from developing residential and employment areas, and the planned western Sydney airport at Badgerys Creek. The proposal is for an east-west motorway of about 14km between the M7 Motorway and The Northern Road which would provide increased road capacity and reduce congestion and travel times in the future. It would also improve the movement of freight in and through western Sydney and is expected to serve the South West Growth Centre and the Broader Western Sydney Employment Area (BWSEA). The Roads and Maritime Services have said they are in the early planning stage for the new motorway, stating "we want to engage early with the community and our stakeholders to gather feedback which will be considered in our decision making and help with planning and design." An RMS spokesperson said the motorway would be completed by mid 2020, before the first flight leaves the airport. Reduce the cost of congestion impacts to the community and business. When projects of this calibre come to light, PlantMiner.com.au makes perfect sense for those searching for plant, equipment and subcontractors. It’s confidence on two levels – registering with a construction marketplace leader and knowing that the service is a proven time and money saving tool for your company. Sourcing the hire gear you need with PlantMiner is simple, it’s FREE, and it saves you time and money – and if you want to get ahead of your competitors when it comes to putting bids forward for your next project, we can help source the quotes you need at the click of a button.